The Peace silver dollar was produced by the United States Mint from 1921 to 1928, and again in 1934 and 1935. Noted for being the last circulating U.S. dollar coin struck in silver, this $1 coin was released the same year the Morgan dollar was discontinued. Read on to learn more about the Peace dollar’s history, design, and mintage. During World War I, millions of silver dollars were melted for the war effort, representing nearly half of all the Morgan dollars ever struck. In order to replace the coins that were melted, the United States Mint was required to strike millions of new silver dollars following the passage of the Pittman Act in 1918. In 1921, it began to do so, using the older Morgan dollar design. Coin collectors began lobbying the Mint to produce a coin to memorialize the end of World War I. As a result, the U.S. government held a competition to create a coin design emblematic of peace. Although originally intended as a commemorative coin, it was put into circulation as the Peace silver dollar. Like its predecessor, the Morgan silver dollar, it contains 90% silver and 10% copper in a 38.1mm diameter coin. The dollar’s total weight is 26.73 grams, and the silver content is 0.77344 troy ounce. 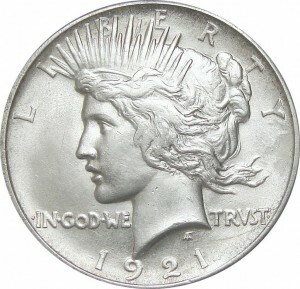 The first Peace dollar was struck on December 28, 1921. Just over a million were minted with the 1921 date. In 1922, more than 84 million Peace dollars were minted in San Francisco, Denver, and Philedelphia. Between 1921 and 1935, a total of more than 190 million Peace silver dollars were minted in these three locations. The highest quantities were minted early in the series, while a low of less than 400,000 was struck in 1928. In 1928, production of the Peace dollar ceased, although the coin was reintroduced in 1934 and 1935. In 1965, more than 300,000 Peace dollars were minted with a 1964 date. However, they were never issued due to concerns over silver hoarding due to high silver prices, and it is believed that all of them were melted down. Today, Peace dollars – the last true silver dollar – are highly collectible. In particular, those bearing a date of 1921 or 1928, or a 1934 D that has been struck with a double die, are particularly sought after by collectors. Many collectors seek a complete set, which includes 24 different issues spanning 1921-1935 and produced in San Francisco, Denver, and Philadelphia. In general, silver peace dollars are limited in supply, making them among the most collectible U.S. silver dollars. On the other hand, some low-grade Peace dollars minted in ‘common’ years may be worth more for their precious metal content than their numismatic value.